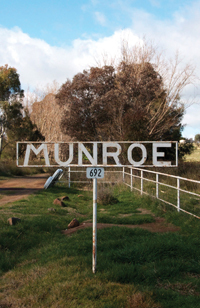 Curated by Professor Anthony Cahalan, Dean, Faculty of Arts and Justy Phillips, Adjunct Lecturer, School of Communication and Creative Industries - this exhibition features metal farm nameplates that provide a distinctive and enduring visual form to the names of farm properties in the rural Australian landscape. Professor Cahalan stated "This exhibition aims to raise awareness of the unique nature of these nameplates as a significant cultural and historical resource for the community. Many property owners and managers take great pride in their property nameplates, but many signs are also rapidly disappearing. There is a real danger that without a strong visual archive of the remaining original signs, these unique vernacular examples of agricultural typography and their histories may be lost." While the shape and form of the base metal used to construct the nameplates has had an impact on the design of many of the letterforms, no two examples in this exhibition are the same. Most of the signs featured in the exhibition were fabricated on-site by the owner or workers in the farm workshop where they used a range of materials - tubular steel piping, flat steel plate and welded steel bars. Some property names reflect strong links to Ireland due to the history of Irish migration to Australia, some relate to the physical geography surrounding the properties, while others represent local Aboriginal place names and geographical features. "My professional background is in graphic design and typography. At CSU I am Dean of a diverse Faculty of Arts, comprised of 8,000 students, and staff and programs across south-east Australia in Albury, Bathurst, Canberra, Dubbo, Goulburn, Sydney and Wagga Wagga. On my regular drives between these seven campuses, I have been struck by the three-dimensional metal nameplates which identify farm properties. They are the foundation of an ongoing research project focusing on agricultural typography called "AGRITYPE" that forms the basis of this exhibition", said Professor Anthony Cahalan. Alongside the images, personal histories and objects collected during this research, there are also a significant agricultural tools on display, drawn from the Museum of the Riverina's permanent collection, to shed further light on the processes of production and fabrication of these nameplates. AGRITYPE: Metal farm nameplates in south-east Australia exhibition opens to the public on Friday 8 April and will be on exhibition until Sunday 15 May 2011 at the Museum's Historic Council Chambers site.